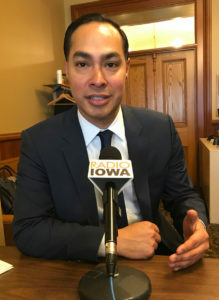 Democratic presidential candidate Julian Castro today said the new absentee voting option for Iowa Caucus-goers may help spur turn-out among Iowa Latinos and other minorities. “Having served as the mayor of the seventh-largest city in the country, I have a track record of getting things done,” Castro said during an interview with Radio Iowa. Castro was San Antonio’s mayor for five years before he served as U.S. Secretary for Housing and Urban Development in the Obama Administration. Castro was born in San Antonio and often mentions his grandmother was a six-year-old orphan who crossed the border into Texas after her parents died in the Mexican Revolution. Castro recently released what he calls a “People First” immigration plan. He’d significantly boost U.S. investment to stabilize the Central American countries many of those seeking asylum in the U.S. are fleeing. Castro would make illegally entering the U.S. a civil offense — punishable with a fine — rather than have illegal entry continue to be a crime. Castro said immigration has helped the U.S. economy grow in the past and the U.S. needs immigrants today to fill jobs. Castro formally kicked off his presidential bid in January and has raised about $1.1 million for his campaign in the first three months of the year. Castro told Radio Iowa if Democrats choose him as their nominee, he will present himself as “the opposite” of Trump. Like many of his competitors for the Democratic Party’s 2020 presidential nomination, Castro supports the goal of “Medicare for All” as well as universal preschool and renewing the federal ban on assault-style weapons.